The journey to success is not a step by step process. The road is chaotic, but with guidance, you can navigate your business through the economic conditions of South Africa. At Centred, we help companies succeed on their journey. Are you a CEO or business owner committed to growing your business into double-digit growth figures? You’ve been running your business for a while? Then this programme is for you. It’s a fact that change is happening at an exponential rate. It is happening so fast that today’s jobs will not be available in the near future. We need to foster a team’s tenacity on collaboration. A great company culture has a positive effect on employees’ state of mind and vice versa. An employee’s state of mind effects how each person behaves and interacts with others. Jacques has been moving teams and people to the next level for over 20 years. He has been a team player and leader almost all his life. The key to this can be heard in any one his three signature talks. Knowledge without experience is philosophy. Experience without knowledge is ignorance. Wisdom is to know the difference. Growth is part of our evolutionary process and it can be chaotic when things go wrong. People and companies (which are made up of people) need to grow to ensure they remain relevant in the future. Those that don’t will become irrelevant and cease to exist. At Centred we help companies, and therefore people, develop and succeed. 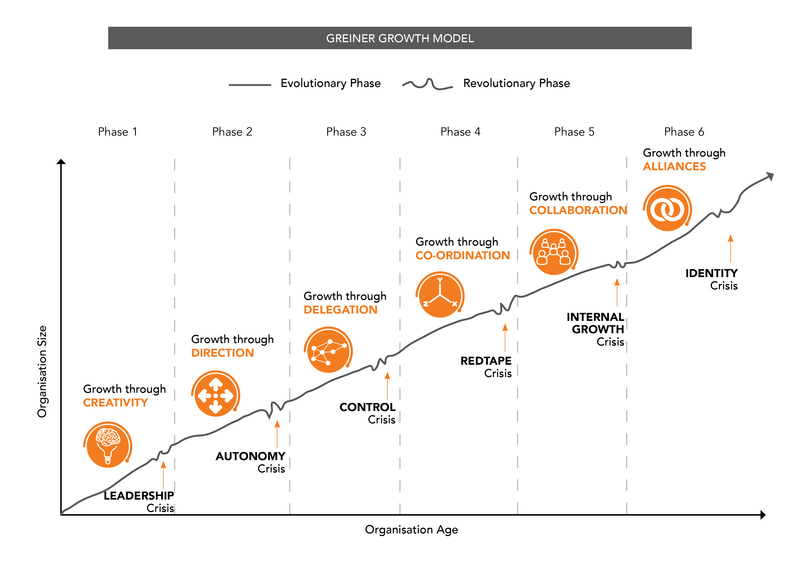 In 1972 The Harvard Business Review published an article written by Larry E Greiner, “Evolution and Revolution as Organisations Grow”, explaining the different growth stages of companies. Using the Greiner Growth Model as our starting point, we apply our experiences and adapt to the circumstances of our clients. Our focus is to help CEO’s, teams and employees develop through their specific growth challenges to ensure they reach the next level. We understand numbers and the story they tell. And we understand you cannot change the story by changing the numbers on a spreadsheet. If you want your business to tell a different story, you need to change what the people do. Jacques has worked closely with myself and my Management Team for the past 18 months, and over this time, the personal growth achieved by each staff member has been phenomenal. I enjoyed working with you immensely- very interesting work. I think you are close to if not onto a very pragmatic way to solve the dysfunctions in teams. I have been working with Jacques for several years now. He is insightful, practical and has great systems that will help any business that needs to grow. I am still a client of his and will continue to work with Jacques in all my future endeavours. Thank you Jacques for such an interactive workshop. Taking us through easy step by step guidance on how to take our small business to the next level. With only 12 clear points to achieve company and business success, we can now create a great business model that’s custom designed for us.